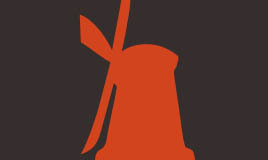 Presenting the NEW, distinguished branding and website for Dutch Boys Chocolate (previously Old Dutch Guys Chocolate). 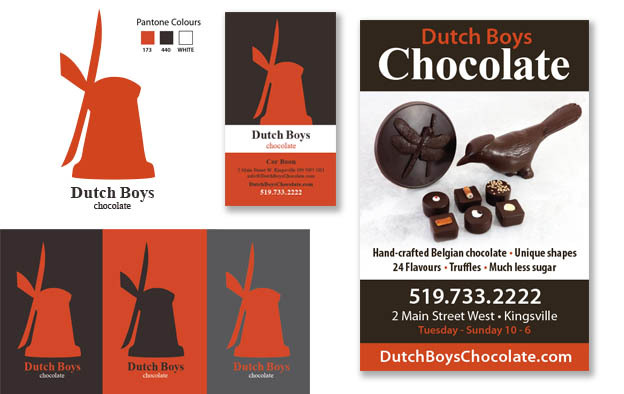 The Dutch Boys were referred to K Design through another business in town (thank you Izabela), and were looking for a new, reliable design company. We were honoured to be selected, and help them refresh their branding, stationery, signage & packaging, jump start their social media and completely recreate their website to a whole new level. 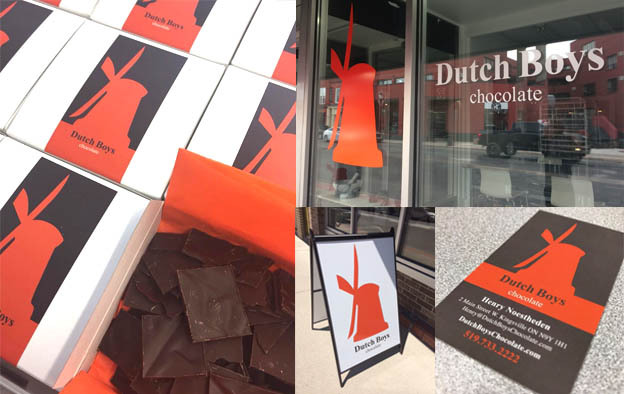 The Dutch Boys Chocolate store was launched just over a year ago, in the heart of Kingsville. The talented and creative founders, Cor Boon and Henry Noestheden, hand-craft Belgian chocolate into unique shapes of birds, beetles, lobster, dogs, cats, fish, frogs, fruit, hearts and much more. Over 100 designs have been completed up to date! They also have over 26 flavours of hand-made truffles…sweet gifts for any occasion. Margaret Atwood has commented on their chocolates on Twitter, and they recently received visits from World Wildlife Federation, & Canadian Geographic. 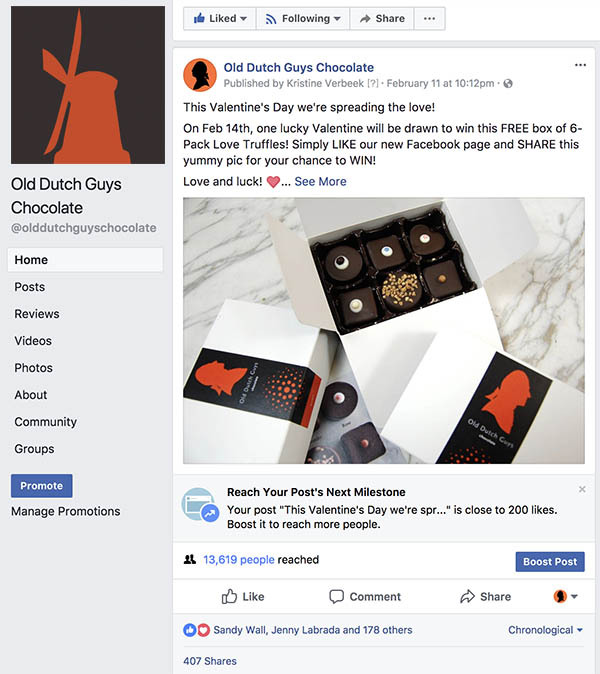 There is always something new and exciting happening in their store, so we created the opportunity for them to share these highlights and connect more intimately with their clients through new social avenues and a modern, tech savvy, digitally delectable website. We have included a full product catalogue, testimonial section, ‘In the News’ announcements and options to received Quotes for custom orders and become a Retailer questionnaire all on their website! 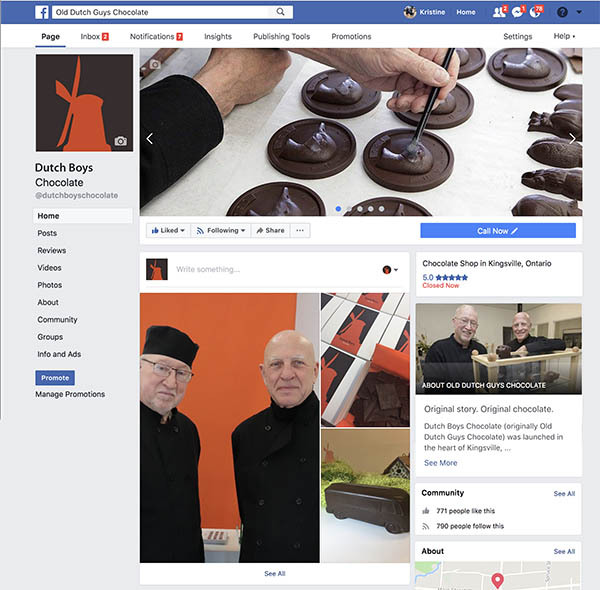 We highly suggest visiting these Chocolatiers, in-store and online, try some of their velvet-textured, mouth watering chocolate and meet these fine, entertaining Dutch gentlemen! And we wish Cor & Henry and their clients all the chocolatey goodness life can bring! Just completed! This responsive site is packaged full with interesting widgets, product catalogue, news updates, chocolate education and MANY images which will make your taste buds drool.